The weekly Torah portion, Kedoshim, teaches the nation of Israel about the importance of living a moral holy life according to the Torah. The parashah opens with the command to “Be holy, for I Hashem your G-d am holy” (Vayikra 19:2). This parashah includes a wealth of mitzvoth pertaining to every facet of life from interpersonal relationships to our relationship with the environment, from our respect for property to sanctifying time and space to the service of Hashem. Achieving holiness through keeping these mitzvot is the required condition that makes Israel worthy of living in the Holy Land. “You shall faithfully observe all My laws...lest the land, to which I bring you to settle in, spew you out” (Vayikra 20:22). The haftorah reinforces the message of Parashat Kedoshim. During the time of the redemption, only the Jews capable of living a holy life will merit living in the rebuilt Land of Israel. Amos prophesies how “All the sinners of My people shall die by the sword…in that day will I raise up the Sukah of David (Temple) that is fallen, and close up the breaches thereof, and I will raise up his ruins, and I will build it as in the days of old” (Amos 9:10-11). Another connection between the parashah and the haftorah is that they both describe the importance of working the land of Israel. “When you come into the land, you shall plant every fruit-bearing tree...” (Vayikra 19:23). Likewise, the return of the people of Israel to the Promised Land during the redemption is characterized by working the land, as the haftorah describes: “Behold, days are coming, says Hashem, that the plowman shall overtake the reaper, and the treader of grapes him that sows seed; and the mountains shall drop sweet wine…(Amos 9:13). The Hungarian Chareidi Rabbi Yisachar Shlomo Teichtal turned to religious Zionism during the Holocaust when he wrote his in depth, scholarly work about Eretz Yisrael, Redemption and Unity. He explained that the establishment of a Jewish State in the Land of Israel will affect even the Diaspora Jews, who will become more unified through their soul’s connection to the center established in the Land of Israel (Em Habanim Semeichah page 95). The meraglim (spies) in the wilderness were not interested in entering the Land of Israel, because they claimed that Torah precedes the Land of Israel. Therefore, they preferred to remain in the wilderness and learn Torah from Moshe. However, according to the midrash, Derech Eretz – the way that leads to the Land – precedes Torah, as it states: “To guard the way of the land, the Tree of Life” (Bereishit 3:24). 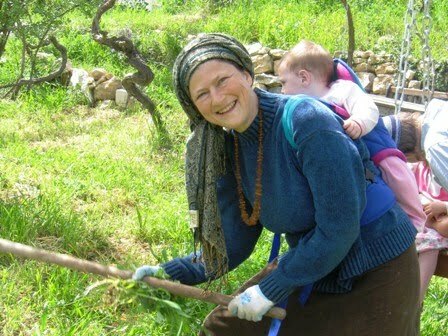 There is no Tree of Life except the Torah as it states, “She is a Tree of Life to those who hold on to her” (Mishlei 3:18). This teaches us that the way to the Land of Israel precedes the Torah. (Tana, D’Bei Eliyahu Rabah Chapter 1). Although the term “Derech Eretz” usually is translated to mean “The way of the world,” according to Rabbi Akiva Yoseph Shlessinger, Derech Eretz refers to the Land of Israel. I can personally testify that there is no way I would have come to live the Torah way, if the Land of Israel had not been in Jewish hands, making it possible for Jews from the Diaspora to come to Israel. I was totally un-inspired by the way the Jewish religion was practiced in Denmark, where I grew up. It was only my connection to Eretz Yisrael, fostered by my grandparents who both made aliyah when I was a baby, which eventually led me to become a Ba’alat Teshuva (returnee to Judaism). In the Land of Israel vibrating with holiness, at the sun-glowing rocks of the Kotel, surrounded by spiritual seeking Jewish youth from the entire world, my soul was reawakened. “I will bring back the captivity of My people Israel, and they shall build the waste cities, and inhabit them; and they shall plant vineyards, and drink their wine; they shall also make gardens, and eat their fruit. And I will plant them upon their land, and they shall no more be plucked up out of their land which I have given them, says Hashem your G-d ”(Amos 9:14-15). From the sequence of Amos’ promise in our haftorah, it seems clear that if we first work the land and plant, then Hashem will plant us securely in our home land, without ever uprooting us. Planting in the Land of Israel – connecting our souls to their root – connects us to the Land for all eternity. The early Zionist thinker and writer, A.D. Gordon, wrote so beautifully, “We come to our Homeland in order to be planted in our natural soil from which we have been uprooted, to strike our roots deep into its life-giving substances, and to stretch out our branches in the sustaining air and sunlight of the Homeland…” I feel so privileged to be part of the Messianic promise while preparing the soil of Bat Ayin for sowing the summer crop, and while witnessing the orchard at Midreshet B’erot Bat Ayin grow, as young women from the four corners of the earth return to the Torah of the Land. Munching on our homegrown grapes of the Judean hills, imparts within us the bitachon (trust) in the prophetic promise of our haftorah that the children of Israel will never again be uprooted from our land. Please comment about how Diaspora Jews can strengthen the connection with the Land of Israel.